Claim: "Hurricane Irma likely to be followed by more extreme weather events." Climate Depot Response: "A meaningless statement. 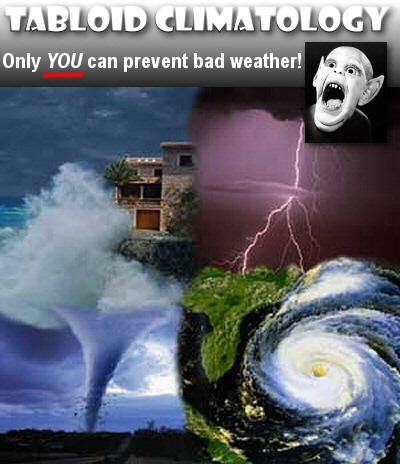 Extreme weather events have always happened and will always happen." See: UK Prof. Philip Stott: ‘From the Babylon of Gilgamesh to the post-Eden of Noah, every age has viewed climate change cataclysmically, as retribution for human greed and sinfulness." "Extreme weather events are ever present, and there is no evidence of systematic increases." Stop the confusion! Global warming will cause less hurricanes or more hurricanes or more powerful but less frequent hurricanes or have no known impact on hurricanes and will cause less rain or more rain. In other words, predict every possible outcome and you too can claim you predicted it! No matter what happens with hurricanes, the climate establishment can confidently claim, they were right. Climate Depot reviews Gore's sequel: 'Stand up and cheer' moment when U.S. exits UN Paris pact - 'Unexpected hero of the film -- Trump!' - 'A tour de force' to see U.S. exit UN Paris pact. 'A tour de force to see the U.S. executive branch under Trump returned to a pro science agenda by rejecting UN treaty and EPA climate regulations! Gore: "We have had tremendous benefits from our reliance on fossil fuels. Poverty has declined, living standards have increased and we still depend on them for more than 80% of world's energy," Gore opened his talk stating. But then he added, "Must we change?" Aussie Herald Sun newspaper: 'Audience members were physically stopped from recording the speech' - "The former US vice president said in his speech that man-made pollution was equivalent to 400,000 Hiroshima atomic bombs every day. He says the world is only getting hotter, with 2016 the hottest year on record and Australian heatwaves now five times more likely due to global warming."